In cooperation with the U.S. Navy and the Virginia Department of Transportation (VDOT), the Federal Highway Administration (FHWA), Eastern Federal Lands Highway Division, is preparing plans to improve access to the Naval Station Norfolk and to the Norfolk International Terminals. The primary components of the roadway improvements include a new Route 564 (I-564) Intermodal Connector, a relocated Naval Station Norfolk, Gate 6 (entry control point), a reconfigured commercial vehicle inspection station for Naval Station Norfolk and consideration for a future Air Terminal Interchange with the Intermodal Connector roadway. 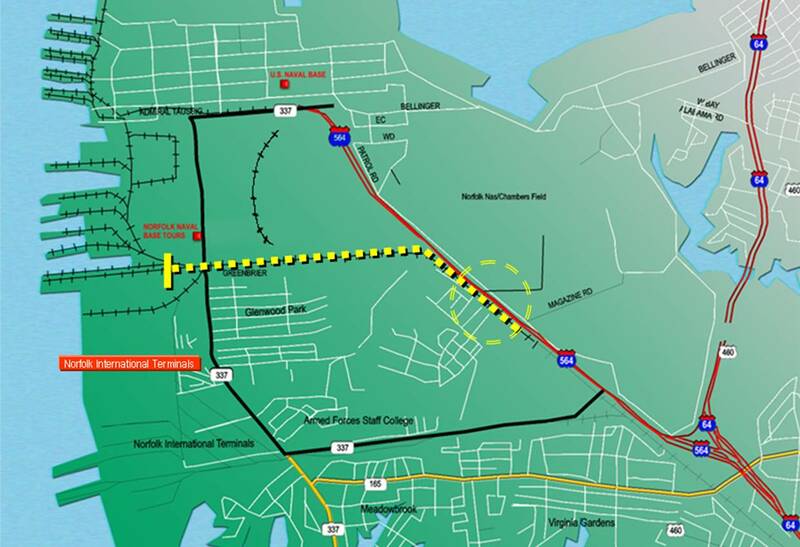 The four-lane divided connector mainline would extend from existing Route I-564 on the east to the Naval Station Norfolk (Virginia Avenue) on the west. In order to comply with the National Environmental Policy Act (NEPA) associated with the transfer of land from the U.S. Navy to VDOT for the road, the U.S. Navy is preparing an Environmental Assessment. The FHWA intends to adopt this EA and complete additional studies in order to better inform a decision document. Critical components of meeting the requirements of NEPA include soliciting public input and the consideration of such input in the documentation and decision-making process. A public information meeting has been scheduled for December 11, 2012 between the hours of 5:00 PM and 8:00 PM in the Sewells Point Elementary School, 7928 Hampton Boulevard, Norfolk, VA. The purpose of this meeting is to provide the public with information regarding this project’s scope, purpose and need, and preferred alternative. Representatives of VDOT, the Navy, City of Norfolk and FHWA will be available to informally discuss specific issues and answer questions during the open forum portion of the meeting. Preliminary design concepts and general information regarding the proposed project will be available for viewing and to aid in discussing details of the possible effects on adjacent properties. All interested citizens, groups and businesses are invited to attend the public information meeting. Please contact, Mr. Jack Van Dop, Senior Technical Specialist, FHWA at (703) 404-6282 or Mr. Phillip Rinehart, Project Manager, VDOT at (757) 494-5478 for any questions related to this announcement. This entry was posted on Tuesday, November 20th, 2012 at 1:52 pm and is filed under Uncategorized. You can follow any responses to this entry through the RSS 2.0 feed. Both comments and pings are currently closed. Maybe someone will ask the Navy, VDOT and City Officials why they lied to the little league about why they couldn’t play there anymore.